Boss Nass is the leader of the amphibious Gungans who live in the Naboo underwater city of Otoh Gunga. 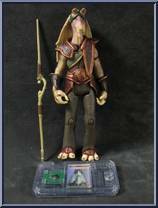 He initially resists the Jedi's pleas for help against the Trade Federation invasion, but later c. . .
A military leader with little patience for the exploits of Jar Jar Binks, Captain Tarpals helped lead the Gungan Army against the invading trade Federation forces. As the beleaguered leader of the Galactic Republic, Supreme Chancellor Valorum faces many challenges to his authority, from the greedy Trade Federation to the manipulations of his one-time ally Senato. . .
With his multiple arms, thrill seeker Gasgano is uniquely suited for the extreme sport of pod racing. 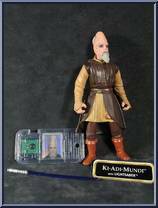 Piloting a cockpit pulled by two dangerously powerful engines, he relies on a crew of pit droids t. . .
As part of the twelve-member Jedi Council gathered on Coruscant at the temple of the Jedi, Ki-Adi-Mundi must help must help make many fateful decisions as the council is called upon to consider the in. 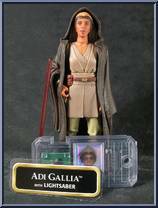 . .
A respected Jedi Master and a senior member of the Jedi Council, Mace Windu wields a great deal of authority through out the Galactic Republic. He is well aware of the dangers of the Sith. For unbelievable speed and hair-raising action, there is no better sport than Podracing. 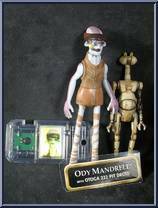 At the Boonta Eve race, Ody Mandrell's luck runs out during a pit stop when a pit droid gets sucked into his ma. 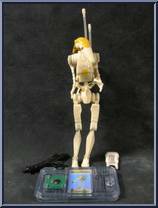 . .
(with Power Harness) A blue astromech droid sporting yellow trim, R2-B1 is one of a fleet of mechanics on the Naboo Royal Starship. It risked its circuits to perform repairs while under heavy incomin. . .
(with Serving Tray) Silver-plated protocol droid TC-14 serves her Trade Federation masters well when she suspects the Jedi identities of Qui-Gon Jinn and Obi-Wan Kenobi.